Recessed top to keep the scale or other items secure. Clinical grade wheels with 2 locking wheels to keep the table in place. Heavy-duty design incorporating high grade stainless steel. A U.S.-made product by Detecto. Detecto's stainless steel rolling baby scale cart allows the weighing to come to the patient. 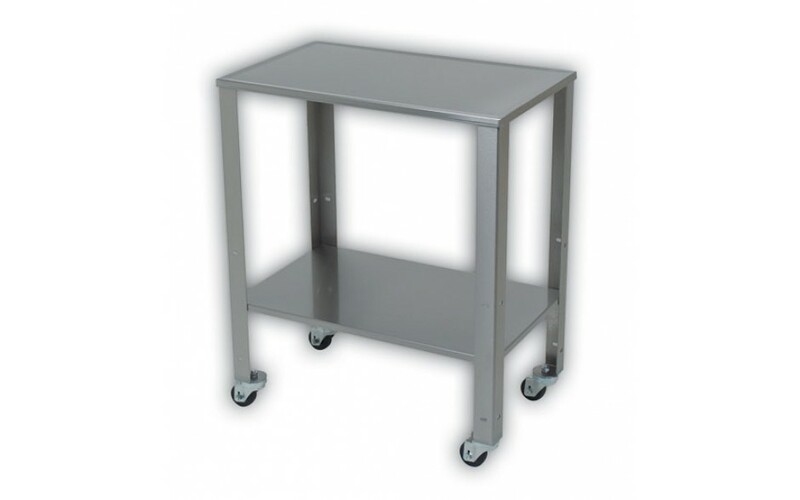 The smooth gliding 2.5" diameter rubolene wheels and 27.75” W x 16.75” D x 33.4" H cart dimensions allow it to easily fit through doorways into patient rooms. A lower shelf with three height adjustment levels allows clinical staff to store patient records and instruments onboard the cart. The spacious shelf space is the perfect size for baby scales, such as Detecto's model 6745 (pictured), which is battery operated for complete portability. 27.75 in. x 16.75 in. x 33.4 in.